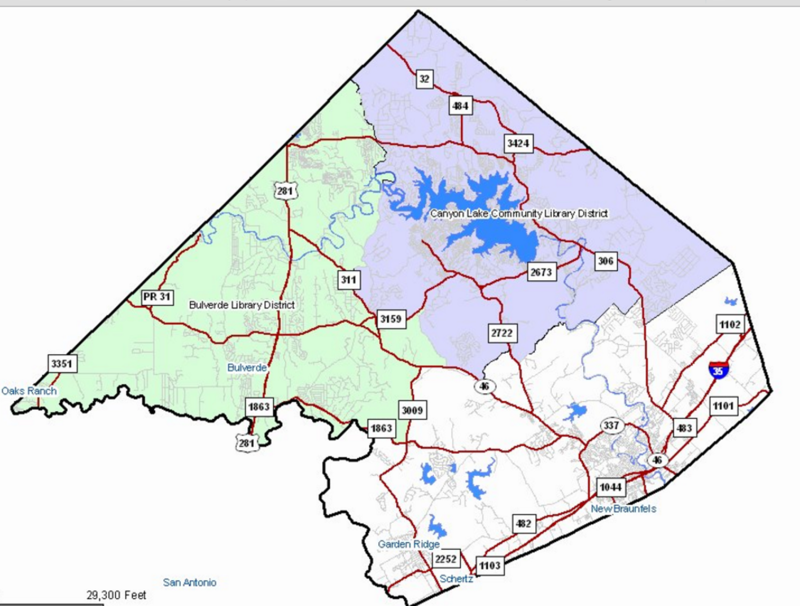 In January 2000 a special election established the Bulverde Area Rural Library District in the western portion of Comal County, funded by a ½ % sales tax, per Texas Local Government Code 326, which established Library Districts. The library’s name became The Bulverde/Spring Branch Library to reflect the service area of the Library District. The Library District does not receive any property taxes and only benefits if you shop in the western portion of Comal County. The Library Director is hired by the BARLD Trustees to manage the day to day operations of the library. Here you will find monthly reports on those operations. In compliance with Local Government Code paragraph 140.008, as provided by House Bill 1378, the Bulverde Area Rural Library District is required to report to the public its debt obligations. The mission of the Mammen Family Public Library is to promote literacy, inspire a lifelong love of learning, and support the arts, science and literary needs of our community. Our vision is to provide access to valuable educational resources and learning opportunities, no matter what age or stage of life, in a safe and welcoming space. The Board of Trustees are elected by the voters of the Bulverde Area Rural Library District every two years--three positions in even years, two positions in odd years. In fall 2015, the board of Trustees commissioned Dewberry & Associates to develop a master plan for the next ten years to help guide the board in their decision making. Community input was sought in early 2016 and the final plan was presented to the board by Dewberry in April 2016. The Board of Trustees of the Bulverde Area Rural Library District are elected by the voters of the district every two years in November--three positions in even years, two positions in odd years. You must reside in the district in order to run for a position on the board. The BARLD Board of Trustees (BOT) is responsible to the tax payers of the library district. The Trustees set library policy and oversee the fiscal management of the tax revenue funds for the Library District. The Library Director is hired by and responsible to the BARLD Board of Trustees and is supervised directly by the President of the Board of Trustees. The Library Director and staff carry out the day to day operations of the Library. The Friends of the Library (FOL) group has 501(c)3 nonprofit status with the IRS and is responsible to members of the FOL for managing the FOL organization. They conduct and support programs and activities for the library by providing funds and volunteers. The Foundation of the Bulverde Area Rural Library District also has 501(c)3 nonprofit status with the IRS. It is set up to provide financial support for the library system by setting up endowment funds and other specific funds, by soliciting and accepting donations to those funds, by administering those funds, and by conducting fund raising activities. The BARLD Trustees meet monthly on the 3nd Monday of the month at 3:30pm. Meetings are open to the public. The agenda will be posted on this webpage and in the library 72 hours prior to the meeting. You will find current agendas and minutes posted below. To request prior minutes or any records requests, please send a written request to the Library Director via email at susan@mfplibrary.org or by letter to 131 Bulverde Crossing, Bulverde, TX 78163. The minutes posted here have been approved by the BARLD Trustees. Minutes of the current meeting are not approved until the next board meeting and will be posted here after they have been approved.